This unique destination is located 1000 km away from the Ecuadorian coastline and is the most visited in Ecuador. Moreover, the islands are known worldwide. This, due to the fact that it was here that Charles Darwin developed his famous theory of evolution. There is so much to learn about them! I recommend that you take a look at a great book that comprises the natural history of the plants and animals found in the Galápagos Islands, as well as tourist sites to visit : Galapagos: A Natural History. When should I go to the Galapagos Islands? The busiest months are July, August, December and early January, and many boats are chartered or booked months ahead. 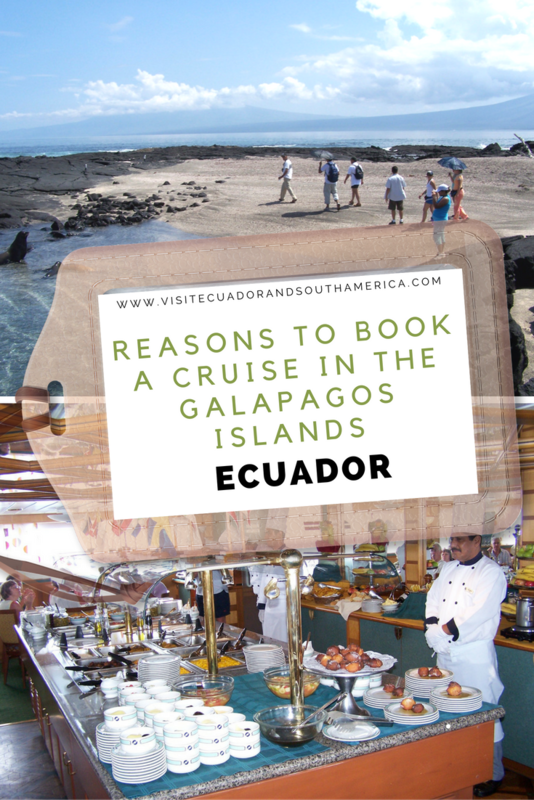 Each island has something very special to see and today I will tell you why you should opt to book a cruise on board an expedition vessel or yacht in order to explore more in-depth the Galápagos islands. Most boats allow its passengers to enjoy snorkeling and enjoy the diverse sea life. A cruise will allow you to get a close encounter with several species and enjoy some activities in this very special place in Ecuador! In 3 to 7 days you get to discover why the Galapagos Islands have inspired the theory of evolution and to have a once -in- a -lifetime experience. Each ship will provide English speaking guides or maybe other languages if required. Send an email here, the Tour Operator I trust and work with will provide the best options based on your requirements. Get a glimpse at one of the giant Galapagos tortoises you can admire on the highlands of Santa Cruz Island. Furthermore, if you would rather stay on land and take short day trips to other islands, a great option is to book your stay at award-winning Finch Bay Eco Hotel in Santa Cruz. The hotel is located in a beautiful pristine area with a swimming pool facing the sea in a calmer area of the island. Just a short distance from the city center. Otherwise, here you can find other great options of places to stay in Galápagos. If you want to book a full 5 or 6-day land option tour that includes these attractions and more, click here. carmen cristina carpiocristina pettersen carpioDarwinecuadorFrommer's Ecuador and the Galapagos IslandsGalapagosGalapagos: A Natural History.islandsplaces to stay in galapagosReasons to book a cruise to the Galapagos islands in Ecuador - South Americatourismtravel to galapagostravel to galapatostravel to south americatravel tripvisitvisit ecuadorvisit ecuador travel to ecuadorvisit galapagosvisit south americaWhen to go to the Galapagos Islands?